Anders Limpar was affectionately known as English football’s original Super Swede. Spells with Arsenal and Everton in the 90s earned him a loyal following thanks to his quick feet and lethal finishing. During his time at the top-level of the English game he picked up a First Division medal with Arsenal in 1991 and lifted the FA Cup with Everton in 1995. Back in his native Sweden, this summer Anders is working as the World Cup ambassador for the largest betting tips community in Scandinavia – The Betting Cottage (or Betting Stugan in Swedish). 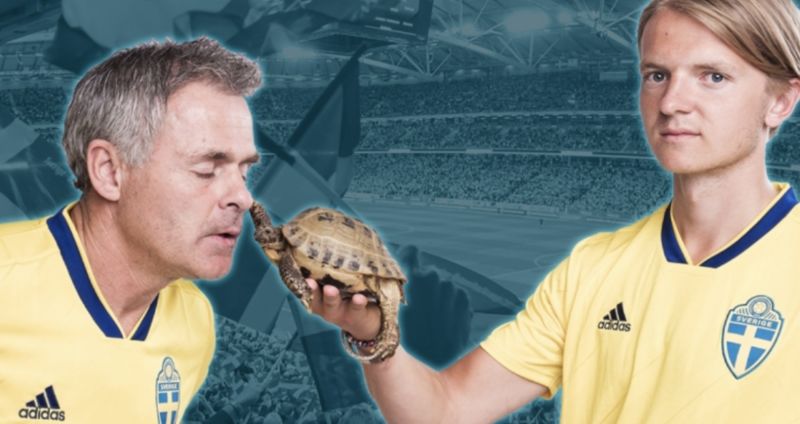 During the tournament he’s been making World Cup predictions together with Nils (or ’Nisse’) the tortoise and a young Swedish betting prodigy called Wiking. Even if your Swedish is a bit rusty you can get a feel for the campaign by checking out the short video below. Filmed on a sunny spring day at Stockholm’s iconic 1912 Olympic Stadium, this was the scene of the Great Britain football team’s gold medal triumph in the football competition that year, where they beat Denmark 4-2 in the final. The three of them – Limpar (The Player), Wiking (The Expert) and Nils (The Chance) – are competing with their betting tips on 18 games throughout the tournament to see who will be crowned Sweden’s best World Cup bettor. At this stage of the tournament with quarter-final weekend looming, Limpar currently heads the standings with a 611 Crowns (roughly £55) profit from his bets on the tournament so far. Anders is still smashing it! The same outfit have recently launched a betting tips site for UK players – BetBlazers.com. Similarly, it features free expert tips for all the World Cup matches and a selection of betting strategy guides, bookmaker reviews, and exclusive bonuses and promotions. Going forward the site will feature betting tips covering all the best events on the British sporting calendar. For England fans a World Cup quarter-final against those men in yellow beckons this coming Saturday. Can the current crop of Super Swedes spoil England’s party and secure a semi-final place for the first time since the Tomas Brolin, Henrik Larsson & Anders Limpar zeitgeist back at USA 1994? If you fancy a flutter on any of the World Cup quarter-finals you should claim a betting bonus from the betting sites and check out some of the betting tips on BetBlazers to make sure your bets are on the money!